Supermarket's plan to repurpose Greenpeace film on palm oil's threat was banned by Clearcast. 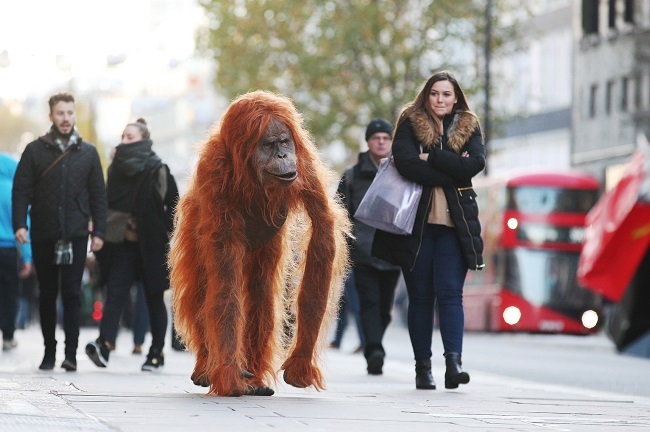 Iceland has sought to amplify the anti-deforestation sentiment sparked by its "banned" Christmas ad by taking a life-size animatronic orangutan around London. The seasonal stunt from Taylor Herring launched yesterday with an adult orangutan clinging to a Christmas tree in Coin Street on the South Bank, before heading to Oxford Street and the riverside opposite the Houses of Parliament. Orangutan in a Christmas Tree #NoPalmOilChristmas from St Marks Studios on Vimeo. The animatronic ape is now set to tour Iceland supermarkets throughout November to raise awareness of palm oil’s role in destroying orangutan habitats, with social media messaging delivered using the hashtag #NoPalmOilChristmas. This week, Iceland said that Clearcast blocked its plans to use the Greenpeace film "Rang-tan", created by Mother, as its TV Christmas ad. The film has been viewed at least 30 million times online, gaining the support of high-profile figures including James Corden and Paloma Faith. Richard Walker, managing director at Iceland, said: "Our stranded, distressed orangutan is a stark and potent symbol of the effects of deforestation. "We are determined to be at the forefront of efforts to guarantee palm oil is not causing rainforest destruction and Iceland will continue to be a driving force until this environmental impact is drastically reduced. "I am immensely proud of the work our food development team has carried out to create this new Christmas range without palm oil – a celebration of our commitment to end its use before the year closes." A team of special effects artists designed and built the animatronic orangutan, which is controlled both remotely and via a specialist puppeteer who has spent years studying the movements of the species. Iceland has pledged to eliminate palm oil from all of its own-label products by the end of 2018.